Owners of the world’s two largest memory chipmakers -- Samsung’s Lee Jae-yong and SK Group’s Chey Tae-won -- boasted of their business confidence during a walk with President Moon Jae-in at Cheong Wa Dae on Tuesday. 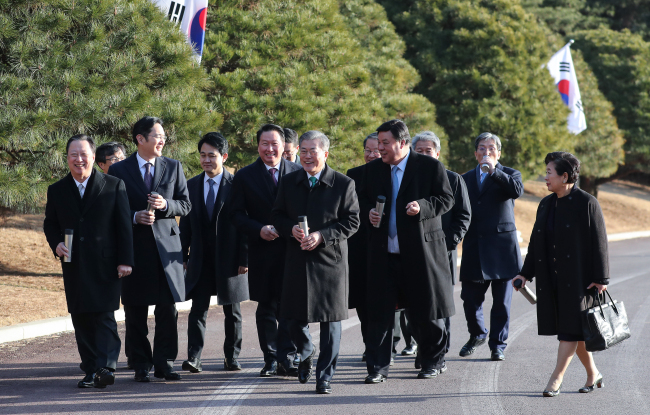 The conglomerate chiefs were among eight business representatives that took a 25-minute walk around the Cheong Wa Dae garden after a more official business meeting. The casual exchange between the two chaebol leaders in front of the president came as the market has been jittery with this year’s less optimistic outlook for the semiconductors industry, which has been carrying a large load amid otherwise gloomy economic performances. The SK chairman then became more serious, explaining to the president it is a typical phenomenon caused by a fall in price rather than in demand. “Demand for chipsets is consistently on the rise, while the prices are being adjusted a little bit,” Chey said. During the conversation, the Samsung heir also requested Moon make another visit to the company’s factory or research center -- for example, a new center on tackling fine dust -- referencing the president’s visit to Samsung’s smartphone factory in Noida, India, in August. They were accompanied on the walk by Korea Chamber of Commerce and Industry chief Park Yong-maan, Hyundai Motor Group Vice Chairman Chung Eui-sun, LG Group Chairman Koo Kwang-mo, Celltrion Chairman Seo Jung-jin, Netmarble Chairman Bang Jun-hyuk and Hyundai Group Chairwoman Hyun Jeong-eun. Moon particularly paid attention to Hyundai’s Hyun, promising her that he would see to better progress in inter-Korean relations, citing her firm’s long-suspended North Korean businesses. Seo, meanwhile, promoted the potential of bio and health care businesses, saying he was willing to supply the president with “endless supplements to help maintain his health.” The chairman added that with collaborations with other firms like Samsung, the local bio pharmaceutical players would be able to expand their share in the global market.